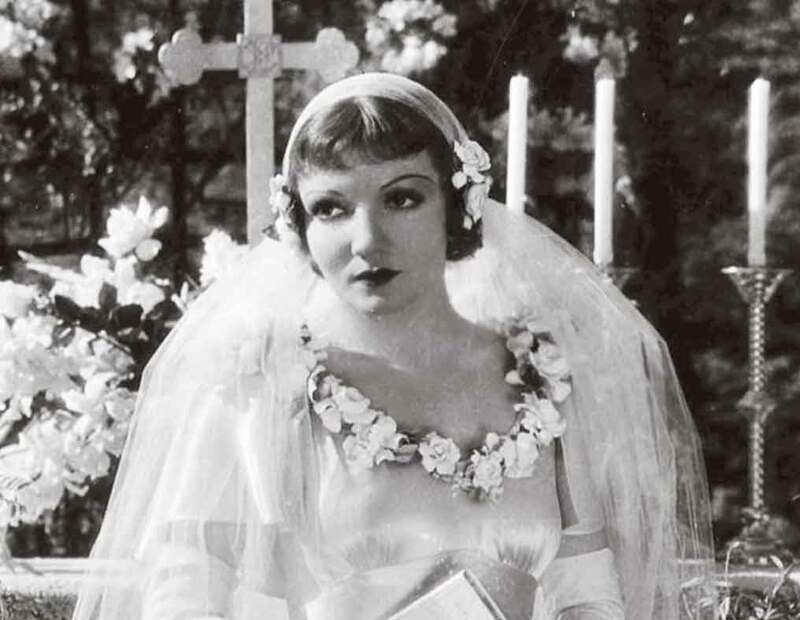 If you’re thinking of channeling your inner 1930’s starlet for your big day–Jean Harlow, Bette Davis, Mae West, and Carole Lombard–you’ve come to the right place. 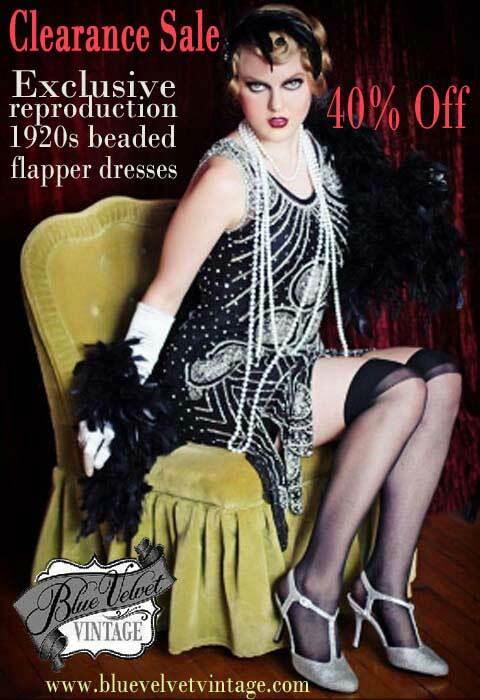 The 1930’s were a transitional period in hair, makeup, and fashion. After the stock market crash, in the midst of the struggling economy, the gamine styles of the 1920’s were replaced by softer, less architectural, more feminine looks, and women drew inspiration from the escapism du jour: the cinema. 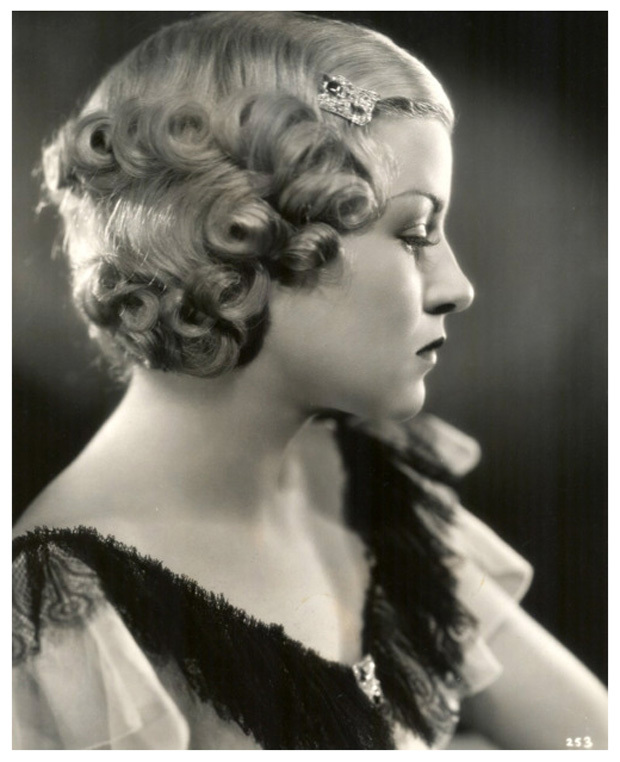 Glamourous Hollywood styles greatly influenced 1930’s women, especially their oft-bleached blonde hair and bold makeup. 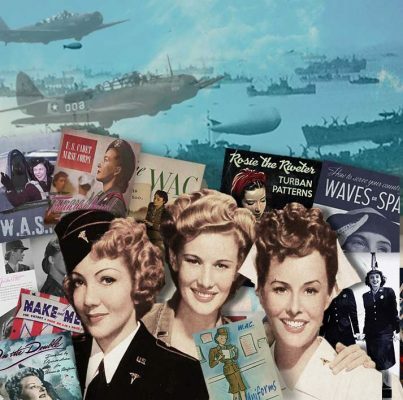 The financial hardships of this period didn’t mark the death of the cosmetic industry. Women and makeup manufacturers adjusted accordingly. 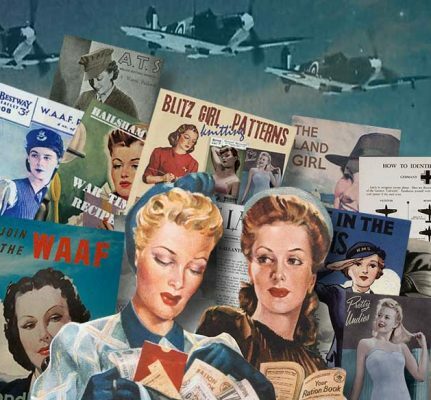 During this decade, Max Factor launched several new products, including cream eyeshadow, lipgloss, and pancake water-soluble makeup. Cosmetics and beauty investments were suddenly rendered affordable. 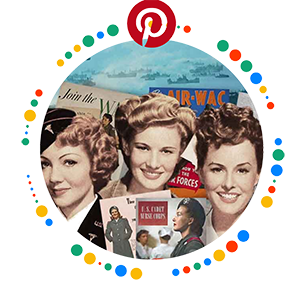 Women could walk to the five and dime and purchase mascara, liner, etc. Thus, the 1930’s ushered in a period of theatrical, inventive make-up. 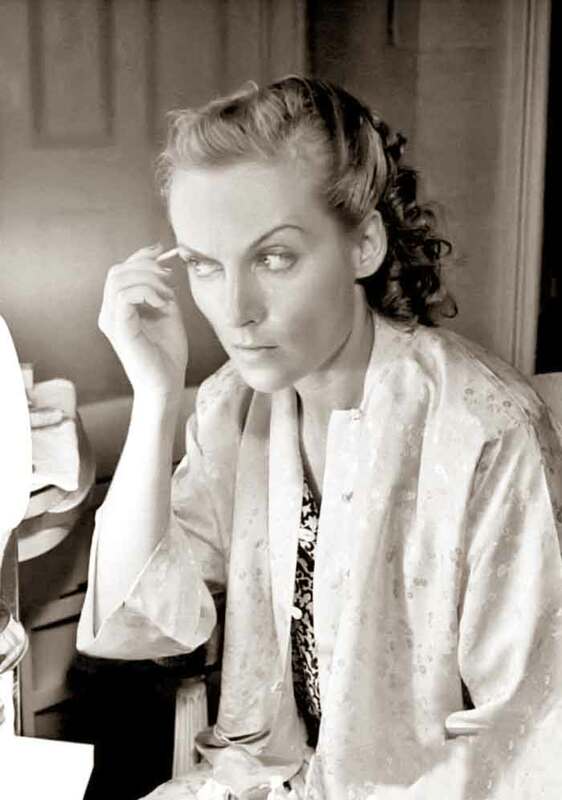 There are several different ways to achieve an authentic 1930’s makeup style. You only have to browse the archives to find many variations on the look. Depending on the occasion and a person’s unique coloring, styles could be tweaked and made event appropriate. During this time, many women put Vaseline on their eyelids. The oily look was thought to give a youthful, light-diffusing shine. If you’re going for a low-key makeup look, try applying Aquaphor or petroleum jelly in lieu of eye-shadow. If traditional cream or powder shadow is more your thing, keep the colors bright and creamy for a luminescence that will look great in photographs and brighten the face. For lips, it’s definitely a good idea to buy a pencil and lipstick in a similar shade. 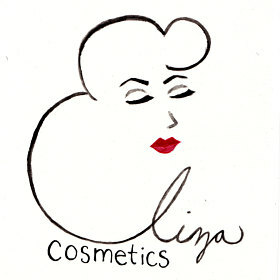 The 1930’s lip requires a defined line in a deep color. Think burgundy, magenta, or a deep red. 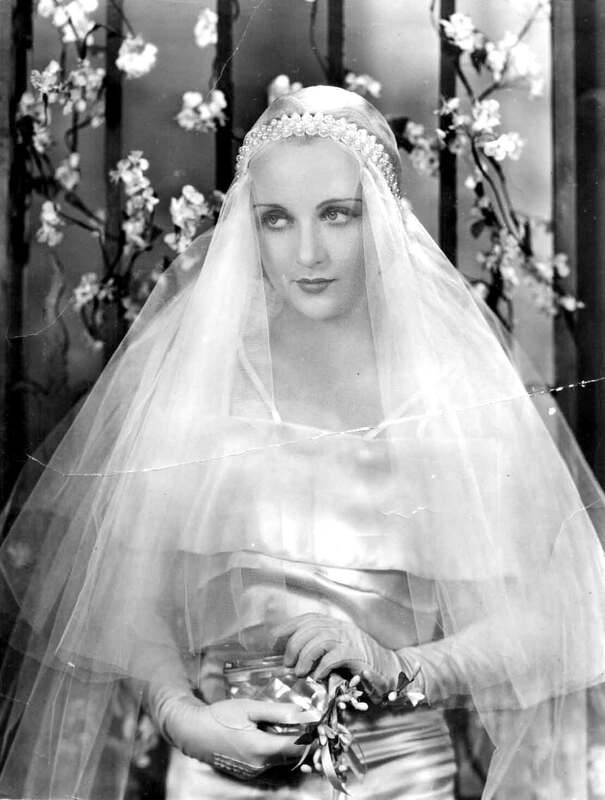 Want to look like Carole Lombard on your wedding day? 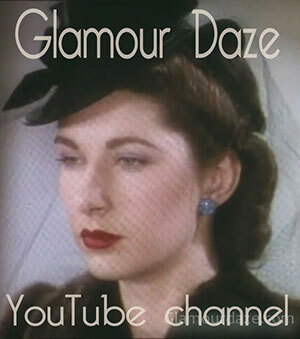 These 1930s makeup tutorials are particularly helpful! 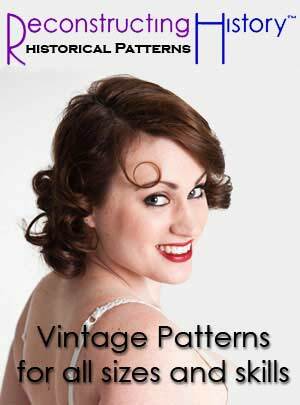 This hair tutorial from Lilith Moon for no-heat vintage curls is a real winner. Foam rollers are affordable and effective when worn overnight. 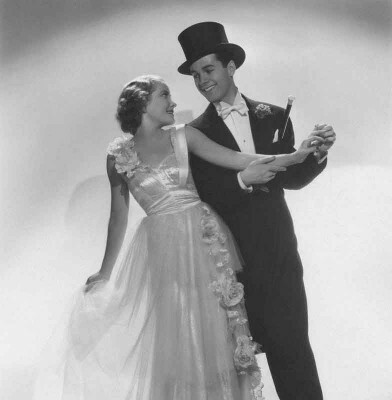 However, we recommend practising a few weeks in advance of your wedding in order to get the hang of it! Make sure your hair is almost dry (about 80% or so), then separate it into sections and use foam rollers to create curls. Start at one end and roll up (either away from or toward your face, depending on the desired curl direction). Spritz them with a little shine spray or very light hairspray. Then go to sleep. (They’re more comfortable than you expect.) Silk pillowcases work best to prevent frizz but they aren’t necessary. The next morning, you’ll wake to discover bouncy, glossy curls. 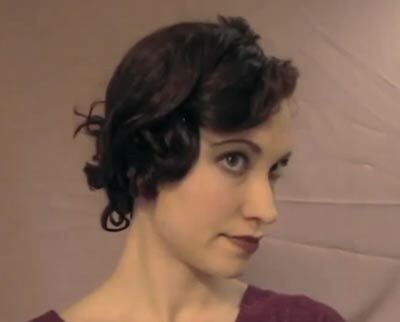 Use fingers or a comb to separate and “muss up” the curls for a 30’s feel. Side part the hair, and use bobby pins to create texture, height, and a more polished look. 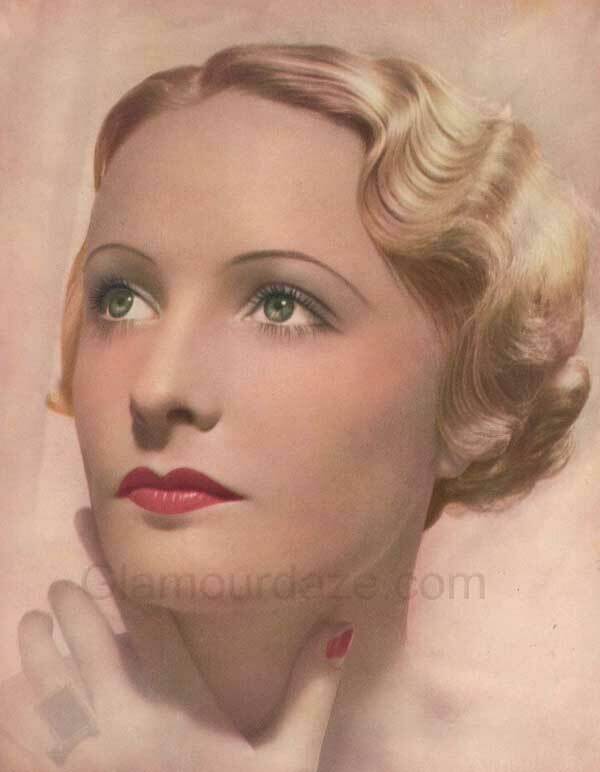 1930s hairstyle for longer hair. If you have longer hair, this How to Pin and Roller Curl a 1930s Hairstyle tutorial by Glamourdaze’s Tia Semer creates another fantastic 1930’s look! 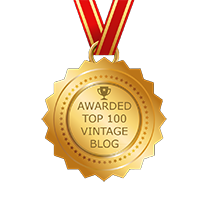 For more inspiration, visit our archives and browse our vintage makeup guides! Congrats on your big day! 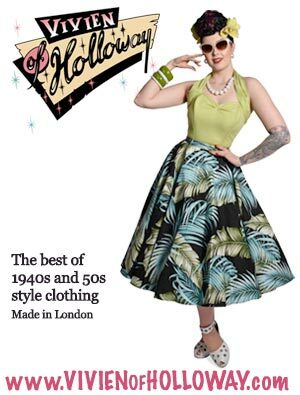 We’re sure you’ll look oh-so glamourous darling! I’ve been simply mesmerized in this vast collection of photos—in reading a friend’s blog this morning, I was so caught up in his story of a staid English uncle so enamoured of a lady that he caught a train from London to Scotland in 1928, simply to have luncheon with her. If anything came of their romance, my friend never knew, but Uncle DID buy a house near her, and lived out his long life in the Highlands, leaving behind an enormous English country house and great rooms of furniture, which his family inherited. The atmosphere was so palpable in his words, for he writes exquisitely of beautiful things and people and times, that I could see the haze of smoke in their air, the scent of Winter-long furs and Toujours Moi and dustings of face powder, with a little rim of unblotted lipstick on the unfiltered cigarette paper left in the ashtray. (from my own blog—a memory from a far time): Her red nail polish matched her lipstick, which was put on with the oddest little down-strokes side-by-side in the middle, higher than her own lipline, then by doing a big old theater-mask-mouth which stretched her bottom lip TIGHT while she did a corner-to-corner Revlon swoop (Love That Red). That lip totally covered, she bit them tight together, transferring a coat to the top lip. The original two little pointy places right in the middle stood brightly high like the tops of angel-wings, their line of demarcation flowing into the flat dryness of a sifty layer of Coty powder which clung to the downy hairs of her upper lip. I so wondered if I might someday use one of your pictures to illustrate a post—one of the ladies with bangs and a cupid’s bow drawn tight. Thank you for all these riches of memories—I look forward to returning to delve into your lovely archives.